These incoming Class of 2023 students are clearly excited. Explore #RollinsSaidYes --then secure your spot on America’s most beautiful campus. Live, study, and flourish in Rollins’ innovative learning community and develop the expertise to succeed as the world evolves. 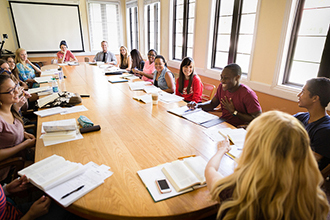 Earn your bachelor’s or master’s degree with the flexibility of a nontraditional program at Rollins’ Hamilton Holt School. 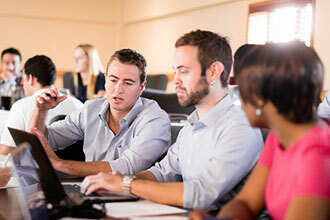 Advance your career with MBA, Executive DBA, and continuing education programs at Rollins’ Crummer Graduate School of Business. Go behind the scenes of the Rollins field study that has brought clean water to the Dominican Republic for more than 20 years, and get a taste of the international adventure waiting for you at Rollins. The beauty of our campus is well established. After all, everyone from The Princeton Review to Condé Nast Traveler regularly ranks Rollins as one of America’s most beautiful colleges. Zoom in, though, and you’ll discover that our campus is beautiful for dozens of reasons beyond its stunning lakeside location and weather that seems perpetually sunny. Dive deep into challenges facing communities in our backyard and around the world on immersive weekend and weeklong experiences led by Rollins faculty and staff. From the community vibe to award-winning restaurants, find out what it’s like to be a college student in one of America’s hippest towns. 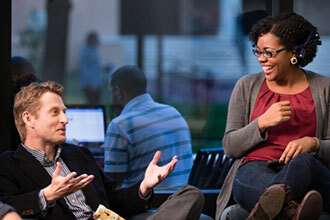 In a Rollins classroom, everyone has a voice. With our small class sizes and discussion-based approach, you not only have a seat at the table, you help shape the direction of your education. What’s life like at Rollins? See for yourself through your future classmates’ Instagram and Twitter adventures. Get an unfiltered look at everything from Rollins’ top-ranked academics to our life-changing field studies through our students’ Snapchat stories.